Every now and then, you look for the next table or the next footnote in larger files. For that, you either have to go through the trouble of advanced search for formatting or special formatting. 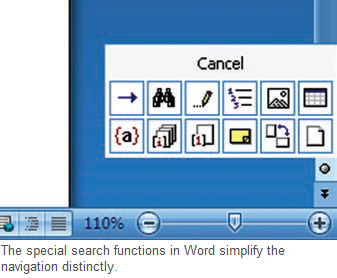 Word has a highly efficient special search option that is hardly known to many people. The icon for which is very inconspicuous and is placed right below the scrollbar, in the form of a circle icon with two double arrows above and below it. First click the circle icon and select what you are looking for in the dialog that pops up. From here you can quickly access the “Go to” and “Search”, options. While with the help of the other icons, you can specifically search for graphics, tables, fields, footnotes or endnotes. Furthermore, you can search for editing or comments in the text, and browse through the contents section by section or page by page. After selecting the mode, you can now search forward or backward for the next suitable element in the document using the respective double arrow icons. The navigation also functions with the keyboard with the [Ctrl] key pressed using the scroll keys. This type of browsing between sections, pages, graphics or other elements allows for a very efficient navigation, especially when working on larger documents.